M Weiss (Woodside) - Book Appointment Online! 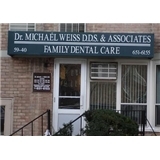 Dr. Michael J. Weiss & Associates is a private high quality dental facility that serves a wide range of communities in the northern and central Queens area of New York City. Our mission is to provide the highest quality care in a pleasant, friendly environment. We customize our treatment to the patient’s individual needs, both personal and financial. We offer a variety of alternatives to achieve the necessary objectives in order to restore the health of our patients. The treatment options are discussed at length, so that the ideal program for each patient can be accomplished. A strong emphasis is placed on prevention and aesthetics. Not only will we eliminate oral infection, be it tooth decay, periodontal, endodontal or traumatic oral episodes, but we will do so with a concern for a cosmetic outcome. The patients are shown how to prevent similar problems in the future. Awesome doctor. I travel a long way to see him. His staff is consistent and caring. As professional as you can get. A truly genuine and kind doctor. Highly recommend.